In our increasingly complex and demanding world, most high school students are at least a little stressed out by the prospect of finding and keeping a job they love. For students with disabilities, the process of securing a job and finding success in the workplace often comes with additional challenges to overcome, from securing transportation to gaining access to modifications. 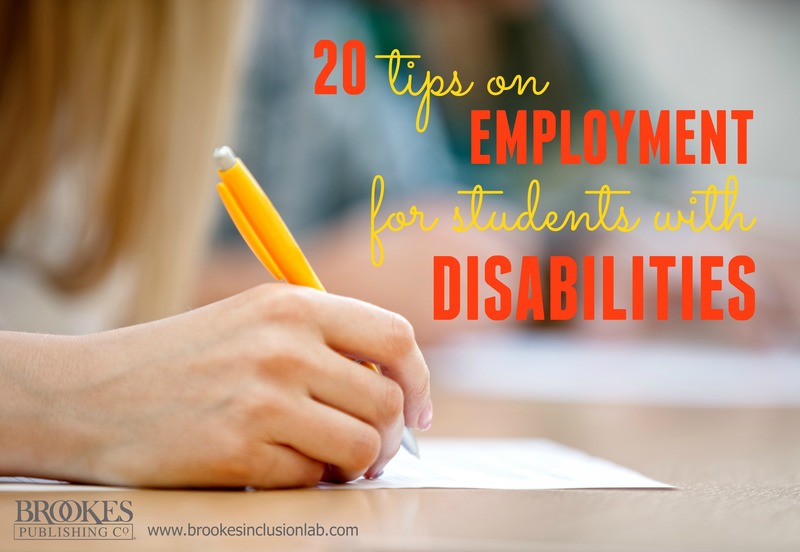 Today’s post gives you 20 “starter strategies” for helping young people with disabilities who are ready for their first job experience. Excerpted and adapted from The New Transition Handbook by Carolyn Hughes & Erik W. Carter, these tips will help you support your students as they start their job search–and take important steps toward fulfilling, self-determined adult lives. Ask them. The best way to figure out which types of jobs would motivate students is simply to ask them. Don’t worry if the goals they share with you seem unrealistic (becoming a rock star or professional athlete). Any conversation about career aspirations will be helpful in illuminating the kinds of jobs and responsibilities that might interest them. Talk to the family. Parents and other family members have probably already had conversations with your student about what she’d like to do when she grows up. Ask them to share with you what they’ve learned about her work-related interests and aspirations for adulthood. Weave job talk into class. Start conversations during class about the different career paths available to your students. You might use the Bureau of Labor Statistics’ Occupational Outlook Handbook as a resource–it describes the training and education needs, earnings, job prospects, and working conditions of hundreds of different types of jobs. Offer choice. Give students frequent opportunities to choose topics of interest throughout the school day. For example, let them pick the topic of a class project or choose which employer to interview with at a job fair. Invite local employers–individually or as part of a panel of presenters–to talk to your students. They can describe the work that their business does, what’s expected of employees, and how students can to prepare for such a job. Have business field trips. Arrange for your students to periodically visit local businesses and organizations to expose them to new career possibilities they haven’t yet considered. Create a task analysis of a job search from start to finish. Walk students through every step of the process over the course of a semester or instructional unit. Be sure to provide lots of examples and hands-on practice experiences. Get the employer perspective. Invite local business representatives to visit your students and discuss the job search process from the perspective of employers. Ask them to talk about how employers prefer to be approached and which skills and qualities they look for in potential employees. Make sure you leave time for students to ask their own questions about the job search process. Connect students with local resources. Show students how to make the most of local resources that can help them in their job search. Your community may have one-stop career centers, local employment offices, web-based job banks, or other resources your students can draw on. Make a list of helpful employment resources and instruct your students in gaining access to them. Start a “job club.” Students can learn a lot from peers who have been through their own job searches. Creating a “job club” can be a great way to encourage students to share their job-search stories and strategies and help each other problem-solve challenges they encounter along the way. Develop a task analysis that clearly lists each step of the activities your students will need to complete on the job. You can use this list to guide your instruction, collect performance data to see how your students are doing on the job, and evaluate progress. Explore modifications. Some students won’t be able to meet all job responsibilities in the same way their co-workers can. Set a meeting with a supervisor and talk about making modifications to selected tasks or implementing alternative performance strategies. Provide direct support, then fade it slowly. When students first start a job, they might benefit from having you close by as they learn and practice their new job skills. As they master these proficiencies, though, it’s important to gradually fade your direct support so your students can learn to self-manage and use their new skills independently. Tackle transportation challenges. Transportation can be a big hurdle for many young people with disabilities–when students can’t travel around their community independently, it limits their ability to get to and from work and participate in after-work social activities with co-workers. Explore local transportation options and teach your students how to arrange for a ride, walk safely to nearby activities, or problem-solve their transportation challenges in other ways. Teach communication and social skills. Your students might benefit from instruction in strengthening the skills they’ll need to succeed on the job and develop friendships with their co-workers. Review with your students how to greet others, conduct conversations in person and on the phone, send text messages, check and use email, ask for and share advice, access social media, and develop other relevant communication and social skills. To support your students’ success on the job, develop respectful and open collaborative partnerships with their family members, supervisors, and co-workers. Allay parent fears. Some parents might be afraid that their child’s financial benefits will be negatively affected by early job experiences. To put fears to rest, give parents clear and accurate information about the ways in which their child’s income might affect financial and other supports. Check the U.S. Department of Labor’s Office of Disability Employment Policy’s website for information about incentives to work for young adults with disabilities. Boost the work-to-home connection. Encourage parents to give their children household chores that will foster a sense of responsibility and teach critical work-related skills. This will prepare them for a job–and reinforce the skills and attitudes they’ll need for ongoing success in the workplace. Discuss expectations. Set the groundwork for success for your students by determining exactly what’s expected of them on the job ahead of time. Before their job training begins, sit down with their employer and talk about specific job expectations they have for each other on the job. Mapping out requirements and specific processes ahead of time can help the student start the job with confidence and fit in with co-workers. Collect insights from co-workers. Your students’ co-workers can be a great source of first-hand insight. Ask them what they’ve personally observed about your students while on the job. What’s working well? What are their most positive qualities? What might they need more support with? They may reveal strengths and talents (as well as needs) that you haven’t had the opportunity to directly observe yet. Keep checking in. To ensure that small challenges don’t become big concerns, check in regularly with your student’s supervisor (but be sure to agree ahead of time on the most convenient check-in times and strategies). Also, ask parents to share their insights into how the job is going, whether their child is enjoying the work, and if any additional services or supports might be helpful. Want more advice on preparing your students for the world of work? 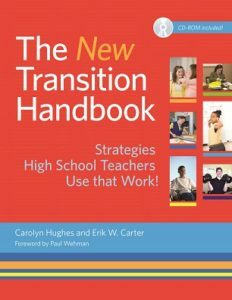 Check out The New Transition Handbook–it’s packed with 500 research-based, teacher-tested strategies that help students with disabilities make a smooth transition to adulthood. Have a student who wants to pursue self-employment? Start with this post, which answers 10 commonly asked questions about self-employment for people with disabilities. Explore 20+ other books on transition and employment on the Brookes website.